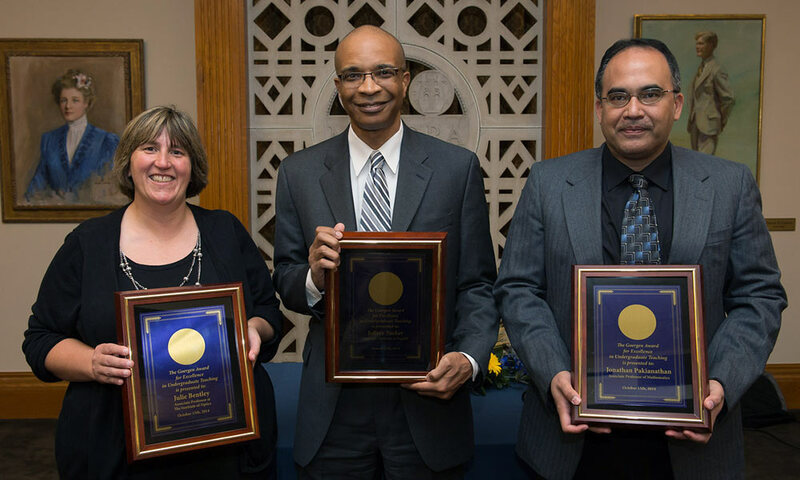 In acknowledgement of their contributions to undergraduate education, professors Julie Bentley, Jeffrey Tucker, and Jonathan Pakianathan were honored with the University of Rochester’s 2014 Goergen Award for Excellence in Undergraduate Teaching. The Goergen Awards recognize the distinctive teaching accomplishments and skills of faculty in Arts, Sciences, and Engineering, and they are named for and sponsored by alumnus, trustee, and former board chairman Robert B. Goergen and his wife, Pamela. At a reception on Wednesday, Oct. 15, the University formally recognized this year’s winners, who were nominated for the award by the chairs of their academic departments. Jeffrey Tucker joined the Department of English 15 years ago. He is highly regarded by students and colleagues for his passion for teaching and his intellectual and professional generosity. He is actively involved in the Frederick Douglass Institute for African-American Studies and with the Office of Minority Student Affairs. He is also a strong supporter of the University’s International Theatre Program. Letters in support of his nomination note that Tucker sparks a love of learning in his students. As a mentor, he builds confidence and skills in students, and helps them discover their voice as scholars and writers. His supporters hold him in high esteem for his knowledge of racial representations and cultural and identity politics in literature. “Jeff’s contributions to undergraduate education and throughout the College deserve thunderous applause from all of us,” said Rosemary Kegl, chair of the English department. Former student and current teacher Andrea Ferrara Popp, Take Five ’05, wrote, “if imitation is the sincerest form of flattery, then my strongest praise for Dr. Tucker’s teaching can be seen in the way I teach my own English classes.” John Michael, professor of English, said that Tucker has the gift of “tact and courage” to teach courses that deal with difficult subjects, such as the history of race and racism in America.